A verb is in the active voice when its form shows that the person or thing denoted by the subject does something, or, is the doer of the action. The active voice is so called because the person denoted by the subject acts. My grandfather planted this tree. A Verb in the Passive Voice when its form shows that something is done to the person or thing denoted by the Subject. 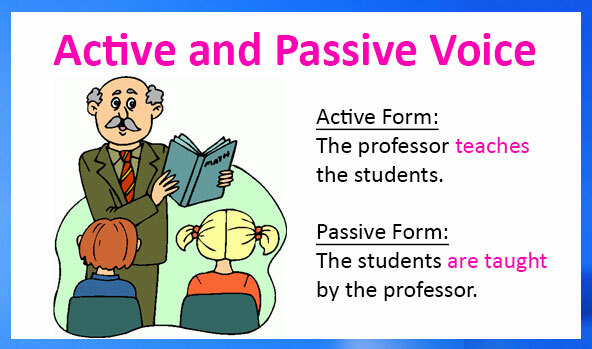 The Passive Voice is so called because the person or thing denoted by the Subject is not active but Passive, that is, suffers, or receives some action. The subject in the active sentences becomes the object in the passive sentence. The verb forms also change in the passive voice. The verb form changes are given in the table below. The rubbish hasn’t been collected. The streets are swept every day. Your hand will be X-rayed. You will be met at the station. My car has been moved! D.	When we are more interested in the action than in who does it. A new public library is being built. When he arrived home, he was arrested. When their mother was ill, the children were looked after by the neighbors. Change the following sentences into their passive voice form. They threw away the old newspapers. John is writing a book. They carried the injured player out safely. I was writing a letter when the bell rang. Who will take the cat to the vet? I had done the project myself. Will you be watering the plants later? Can they create a new plan? You have to write an apology. This picture was painted by Duffy. The old newspapers were thrown away by Duffy. A book is being written by John. The injured players was carried out safely by them. A letter was being written by me when the bell rang. By whom will the cat be taken to the vet? The project had been done by myself. Will the plants be watered by you later? Can a new plan be created by them? An apology has to be written by you.